The following report on the laser show at Belur Math on January 31, 2014 was reproduced from The Telegraph, a popular newspaper of West Bengal, India. It was reported by Sudeshna Banerjee. 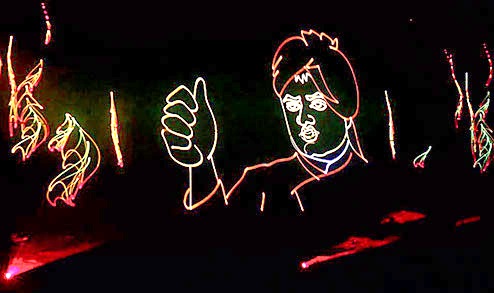 The 150th birth anniversary celebrations at Belur Math came to a close with a spectacular laser show on Swami Vivekananda on January 31. The one-hour show titled Swamiji traced the monk’s journey starting from his birth and ending with his Mahasamadhi 39 years later. Creation by Manick Sorcar, the eldest son of magician P.C. Sorcar and an US-based engineer who creates magic with laser animation, the show had premiered at Science City in October 2012. After a string of shows across Gujarat and the US, it returned to Delhi this January where the local Ramakrishna Mission hosted it. “We heard of the success of the show in Delhi and requested Sorcar to come to Belur Math. This place is Swamiji’s greatest signature,” said Swami Girishananda, manager, Ramakrishna Math, Belur. Though the show had been beamed at the convocation of Bengal Engineering and Science University (BESU), this was the first public show in Howrah and was watched by an audience of around 15,000. “It was as if he was painting the events of Swamiji’s life with a paintbrush before our eyes. It was fascinating,” he added. “This show is as much for the Western audience as for the younger generation of India,” said Sorcar, who was moved by the emotional reception the show got from the devotees. “So many elderly people blessed me,” he added. Laser art involves a single ray running across the screen to join dots to form a picture and then immediately erasing the unwanted lines. One has to supply 30 such pictures per second to create laser animation. “Swamiji is the longest laser documentary done on any personality,” claimed Sorcar.